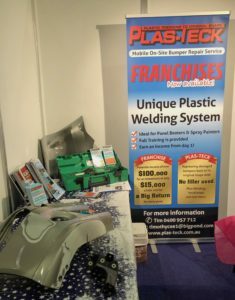 Plas-Teck has just released the first areas in Australia to be franchised. Over the past 21 years, Plas-Teck has enjoyed success in the UK, with Mr Coe, Director, selling over 23 areas across the country. The main customer base was from (and still is from) direct line insurance. In Australia, we hope to have all capital cities serviced within 5 years, so this is a big opportunity for someone to get in early. It has huge potential in the world of plastic repairs, with the knowledge and know-how that Plas-Teck can bring to you and your own business. Plas-Teck has been operating in Melbourne for the last twelve years and has a very good customer base. With RACV Insurance and their volume of accredited repairers, Plas-Teck repairs all types of plastic bumpers, head lamps and air boxes to a very high standard, ready to paint. On-site and in most cases same day service with the best tools of the trade, Plas-Teck has developed a technique to repress bumpers back to their original shape and with the new plastic presser welding, it is also 100% guaranteed.